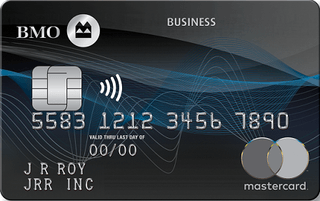 BMO Rewards Business Mastercard is typically available to those with excellent credit scores (650 or greater). On cell phone/internet bill payments. If cash back isn’t your preferred type of reward, you should consider the BMO Rewards Business Mastercard. This business credit card allows you to earn BMO Rewards points which you can redeem for electronics, gift cards, travel and more. The card’s annual fee is $120, and is waived in the first year. SMB owners with significant monthly gas, office supplies, mobile phone and internet bills have the most to gain from the BMO Rewards Business Mastercard. We recommend the card to those whose business expenses in those categories total more than $5700 per year ($475 per month), which will offset the card’s annual fee of $120.